The Plympton Board of Health met on Tuesday, Nov. 17. While the bulk of the business discussed involved septic systems, the board, along with Health Agent Cathy Drinan and their administrative staff also discussed the security of the Federally owned property at 59 Parsonage Road, a property with too much trash on site and the inspection of a trailer to make sure it did not have an illegal septic system. The infamous property at 59 Parsonage Road is discussed frequently at various committee meetings in town. The property is currently owned by the United States Department of Agriculture, because the previous owner defaulted on a USDA loan. The property contains a burned-down barn, an historic house in disrepair, and several illegal trailers that were to be used for agricultural workers. 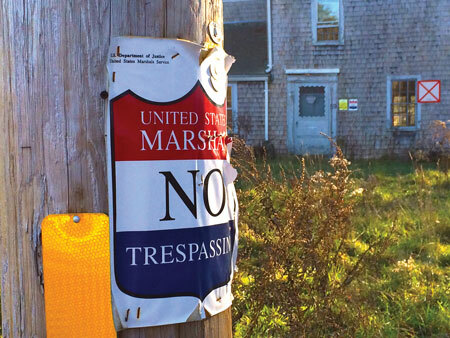 The Community Preservation Committee and the Conservation Commission have sought to acquire it for the town for use as open space, but the odd history of the property and the state of disrepair of the structures remaining on it has flummoxed the process. The last time the USDA tried to auction the 35-acre property in April, there were no bidders. The Board of Health has become increasingly concerned about the property from a health and safety point of view. Board Chairman Art Morin stated that he had been notified that some money had been secured by the USDA to further secure the property, but he does not know the amount and specific purpose of the funds. “I don’t think some plywood and nails cost very much,” he said, with his typical dry sense of humor. Morin joked that he’d board up the house himself, but then quite seriously noted that he would be calling up the head of the Massachusetts division of the USDA to order the federal government to board up the house. The USDA doesn’t have a good history of working with the town on this property, and they are the responsible party for maintaining it, according to Drinan. Morin and Drinan have had to frequently visit the site to post warnings, as there has been evidence of trespassing and the entire property is unsafe, including mold in the buildings and a hard-to-see pit beneath the ruins of the barn. A property owner on Mayflower Road was previously asked by the board to remove bags of refuse from his yard. Trash that remains standing for too long can attract various nuisance animals, including those that carry disease. Health Agent Drinan became concerned due to this risk and ordered the trash removed. The property owner took care of the matter promptly. The board closed the file. A concerned citizen alerted the board to the possibility of an illegal septic system hook-up to a trailer on Palmer Road. Both Drinan and Morin visited the property to inspect the trailer. Upon their arrival, they discovered that the trailer had been lived in for some extended period of time in the past, but was not currently occupied. The owner stated that he would likely scrap it soon. Most importantly, there was no evidence of any illegal septic system for the trailer. The board closed the file, and both Drinan and Morin noted that they enjoyed meeting the property owner, who was extremely cooperative.